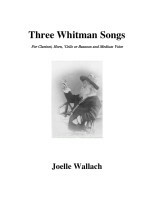 Like the Walt Whitman poems on which they are based, the Three Whitman Songs display Whitman’s views, his idealism, exhilaration and disillusionment. 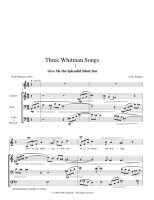 The ascending triplet melodic motif of the first song, Give Me the Splendid Silent Sun, reflects not only the natural rhythm of the text, but also Whitman’s exuberant spirit. The song ends, as the poem ends, with the bitter suggestion of Whitman’s post-Civil War despondency at mankind’s cruelty. 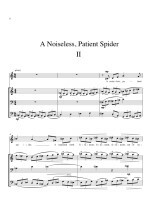 The second song compares the creativity of the soul’s continual search to a spider’s constant weaving. 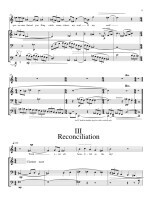 The instruments introduce a characteristic weaving figure which creeps into the vocal line as well as accompanying it. The clarinet does not play the last song. Reconciliation is both its subject and its title. As variants of the rhythmic and melodic patterns of the first two songs recur, recalling the work and worries of the soul, the singer heroically voices Whitman’s resolution of his conflicting perspectives. 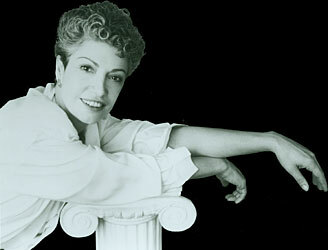 Joelle Wallach’s Three Whitman Songs was composed during 1989. 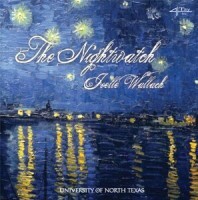 Like her other vocal chamber music it fuses Wallach’s central ongoing concerns in chamber music with those in her vocal output. The voice is used in a natural, unforced way and explores the implicit rhythm and melody of the spoken word. As Whitman requests in the first song, the singer appears to warble “spontaneous” songs. The instruments take up the same musical ideas and in developing them, weave a context for the voice, all the while answering the voice and one another. …away, aside from the noise of the world. Give me to warble spontaneous songs, reliev’d, recluse, by myself, for my ears only. Give me nature’s primal sanities. Ever unreeling, tirelessly speeding them. bend down and lightly touch his face with my lips.